Adriana Balboa was born in Montevideo, Uruguay. 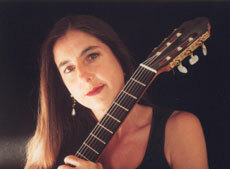 She studied guitar with Eduardo Fernández at the Uruguayan conservatory. She received many scholarships to study guitar in Argentina, Brazil, Uruguay and Spain. In 1993 she received a DAAD (German Academic Exchange Service) scholarship to continue her studies at the Hochschule der Künste in Berlin and later at the Hochschule für Musik “Hanns Eisler”. She graduated with a diploma from Thomas Offermann’s class. Adriana Balboa makes regular appearances at major Festivals and plays in a number of chamber ensembles, including the „Ensemble Percanta“ She also played with the orchestras Berliner-Latino-Solisten and Berlin Sinfonietta. She organiced and directed the Lateinamerikanisches Gitarrenfestival held in Berlin on November 2001.